Note: Sister Ships: LYCOMING (1880); CONEMAUGH (1880); DELAWARE (1878). Erie & Western Transportation Co., Buffalo, NY. 24 & 48 x 48" engine, Cuyahoga Iron Works, Cleveland, OH 1878. 9' 7" x 17', 90# tubular boiler. Near Cardinal, QUE, Galops Canal. 1878, Oct 29 Aground Herson's Island. 1880, Apr 10 Aground Milwaukee River, WI. 1880, Oct 14 Collision with schooner MURRAY, Lake Michigan. 1883, Sep 27 On shoal east of Bar Point, Lake Erie. 1898, May 27 At Mackinaw, MI for repairs to disabled machinery. 1899 Listed as having 11' x 12' scotch boiler. 1899, Nov Collided into water intake crib off Chicago, sank at entrance of Chicago River; raised & repaired. 1905, Apr Chartered by Lackawanna Green Bay Line. 1906, Jun 27 Owned Great Lakes Engineering Works, Ecorse, MI. 1906, Oct Owned Crosby Line, Milwaukee, WI; rebuilt by Great Lakes Engineering Works. 1909 - 10, Winter Ran Grand Haven, MI - Milwaukee - Chicago. 1910 Crashed into Chicago's waterworks crib in fog. 1914, Oct 30 Boiler room fire damaged hold & cabins at West Shipyard, Milwaukee. 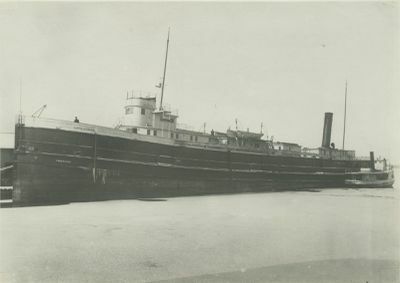 1919, Sep 30 Owned The Lake Ports Navigation Co., Ltd., Sarnia, ONT; C140998; 253 x 36 x 15; 2008 gross/1531 net tons.